A yummy ambrosia of bananas and whipped cream. A yummy ambrosia of bananas and whipped cream. This e-liquid flavor will satisfy your sweet tooth without being too sugary. The smooth vape provides a nice compliment to the creamy taste. It's a dessert favorite without the calories. 100% American-Made E-liquid. I get the banana flavor when vaping, but it's a little too sweet for me. Best flavor they have in their 50/50 line. The Apollo line doesn't have too much dessert ones so if youre a fan of banana cream pies I totally recommend this one. I could seriously vape it all day and not get sick of it at all. Bananas and cream who could ask for more really?? This one is a hit every single time that I've picked it up. I never seem to get tired of it and can vape it all the time. I don't have anything negative to say about this one because it's just so good and doesn't taste artificial. one of my all time favorite flavors. I like the sweetness of this one. The banana flavor really shines and comes through when you are vaping this one. I like that it is very dessert like. I will pick this one up again and again. Really does taste like a banana cream pie. This flavor never gets old and always tastes great. I use it in my Neo kit and really like the setup I have right now with this e-juice it is perfect. The Neo tank really does a good job of bringing the true taste of the flavors out. This is a great flavor and I always recommend it to everyone. This is the flavor that helped me quit smoking. It's sweet but not too sweet and it has a great real banana taste to it. Not like a banana candy at all. I can really taste the banana's and sweet whipped cream. Cannot get enough of this one. I love banana vapes but this has always been my favorite. It is more of a dessert flavor rather than a fruit flavor. It reminds me of a banana cream pie. Very desserty and sweet! Cannot get enough of this one, i've vaped this one for years now!! Great flavor--lots of intensely flavorful clouds! Nice and subtle sweet flavour, both banana and cream coming through. I'm fairly new to vaping, and bought the Banana Cream in an order of 6 e-liquids made by Apollo. Wasn't sure what to expect, but I was particularly looking forward to this one - I love anything banana flavoured! Order process was smooth, items arrived quickly and well packaged. I tried the Banana Cream immediately, and I have to say I wasn't disappointed. The flavour was exactly as I expected - a good, artificial banana. Think of those foam sweets you got in a 1p mix up as a kid, or a certain powdered milkshake brand. The liquid is a little thin, but I vaped with my iStick 30w in both a Nautilus Mini at 14.5w/4.9v and in the iSub Apex at 22w/6.1v and got a consistent flavour and decent cloud production. I would definitely buy this again, but I'll be purchasing at a lower nicotine content. Sweet, satisfying and tasty. Has a thick, syrup citrus flavor and a clean aftertaste. This is the best Banana cream flavor I've had. It mixes well with various chocolate flavors on the market or can be an all day kinda vape all by itself. Perfectly creamy with enough banana flavor to get the hint. Its like banana pudding but not overly strong! Thanks Apollo for this one! I ordered several 30ml bottles of this, after trying the 1st. Very creamy. Could use more banana flavor. I'm usually not too big on flavors but the Banana Cream is really good. It took about a day to get used to a flavor other than tobacco flavor but well worth it. Great Banana flavor without being overwhelming and it produces great vapor & hit. This is now one of my favorites. Thanks Apollo cust. svc. for turning me onto it; love it. For a long time I've always looked at this flavor and passed on it. I finally got the chance to order a bottle of 12mg. It is really nice, definitely Banana and definitely creamy. I agree with what others have said. It is definitely like Banana Taffy. It goes well by itself and with other juices if you like to mix flavors. What I personally would like is if there were a bit more of the banana flavor added as it's a tad light. But definitely recommend this. I had the opportunity to buy some Apollo juice for $.01 with free shipping so I figured, why not! I am pleasantly surprised by this juice! The Banana Cream is a smooth Vape with a nice throat hit, decent vapor, although only a fairly subtle taste of creamy banana. I would give this juice 5 stars if it was more full flavored. I had to look too hard for the flavors but what I do taste has potential. Apollo's pricing keeps it in the mid range and is far better than other juice similarly priced as the ones I've tasted use alcohol based flavoring and aren't worth the bottles they come in. I would definitely re-order but with an extra flavor shot. I plan to try it out and will request an extra flavor shot. Oh, fyi, I'm VERY picky about my juices, usually only buy premium juices from 3 companies...(after 2 full years of vaping I've learned to stick with the juices I know I like). I genuinely feel like this could be a vendor I'd buy from regularly (With an extra flavor shot of course)! I really like the banana flavor that it delivers. I love this flavor a lot. It's smooth,sweet and strong. This is one of my favorites. Im addicted to those cheap yellow banana Popsicle and that's what I expected with this liquid. It DEFINITELY smells like it. Its light and I agree with another reviewer maybe just a teeny bit more flavor would be nice. But its still great! Very light and creamy! The flavor of this juice is outstanding, but I think it needs more flavor. Again, if it had more flavor to it, id would be a fav! I really like the flavor of this e-liquid. I would compare the taste to banana pudding or banana gelato. I like it as a nice sweet treat. I have mixed feelings about the throat hit. I personally do not like a strong throat hit. When I first start vaping this flavor, it delivers a strong throat hit, but after a few puffs it is really silky and does not burn my throat. I would recommend people that love banana flavored deserts to try this. It is just the right amount of fruit and sweet. This flavor is smooth and silky. Tastes great exactly like banana cream. I liked this, but I LOVED it when I added 1/2 Berry Berry!! It accentuated the banana to such a smooth and creamy level. I use this as a nice treat, but have also found myself leaving the house w/this in my pocket to use for the afternoon while doing errands! I just finished making a batch just now - so, off I go! I got the banana cream with the free 10ML bottle offer, I received this today, put some in my protank and BAM! Awesomeness. I wasn't sure what to expect from the banana because of some juices I have had like it weren't so good but this time it was great. This flavor definitely satisfies my sweet tooth. 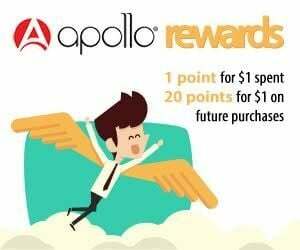 Apollo you got a customer for life. The flavor is solid and reminds me of the banana cream pudding I loved when I was a kid. I didn't notice much throat hit but that's reasonable as it's VG heavy and I ordered it in 12mg. Tasted it in a clean 306 bridgeless 2.0 ohm dripping atomizer on an iTaste SVD. I have the 12 mg and love this flavor. it's creamy rich goodness with a delicious aromatic vape. i also mix it with my French Vanilla and WOW it brings me back to my childhood when I would sit on the porch eating my Bnanana spilt with french Vanilla. Everytime, I taste a new flavor I think it's my favorate, well, so far everyone that I've vaped is my favorate.